i'm beginning to see that i have a morning routine. like an old man. buzzing alarm. i awake. snooze it. i zombie walk out to my corner couch spot with my computer in hand. i go to the kitchen, make coffee. i stand with my upper body hunched over the counter, staring blankly as i wrap my head around kick-starting another day. 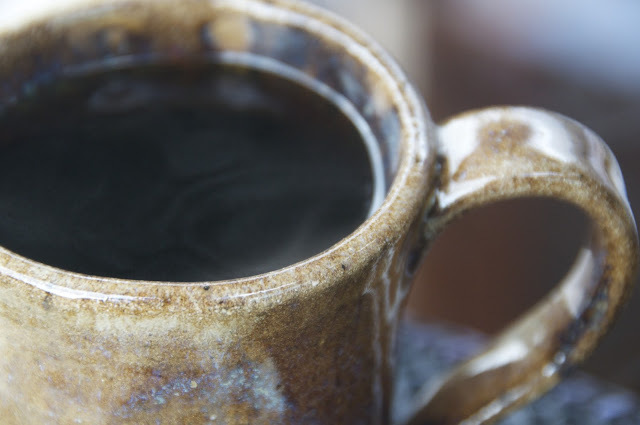 i search for my favorite mug hiding amongst all the other mugs, pour coffee, leave the spoon in the mug always. wedge myself back into the couch. check internety things like email, news, facebook, blog. sometimes i make a to-do list for the day. i add things like 'take a shower' and 'drink tea' to make the list longer so there are more things to slash off. i also really want to eat in the morning. ..those people who claim they can't eat until 11 o'clock...i'm not included in that group. give me toast. give me cereal. give me cakes from a pan. i only pick cereal when there are bananas. the best kind of banana has green at the top...don't disagree with me, this is my routine. once i finish the bowl, there will be milk leftover. i go back to the kitchen and pour more cereal in because i don't like waste, and eating cereal makes me want to eat more cereal. i seem to fall into a lot of these kinds of routines. i have baking routines too. one of them has developed and escalated fast. 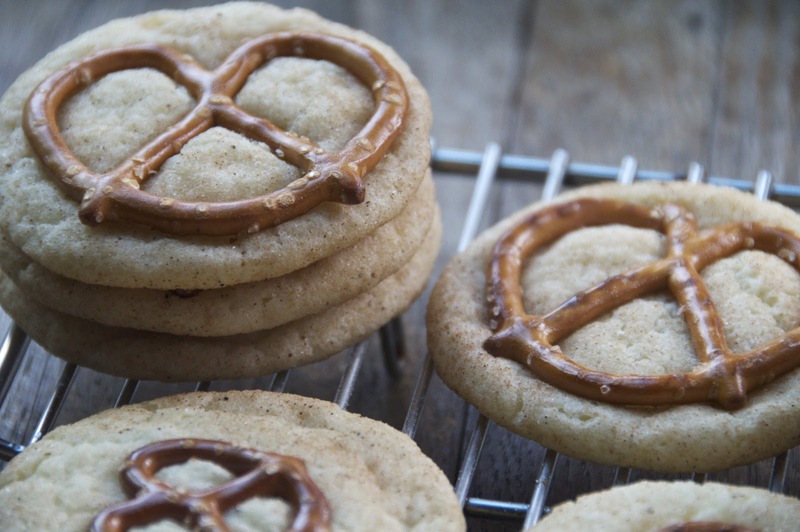 i decide to bake something, i gather my ingredients, i spot the pretzels in the massive pretzel bag. then, i contemplate if i should throw them into the mix. more often than not, i want to. more often than not, adding pretzels makes something better than it was before. 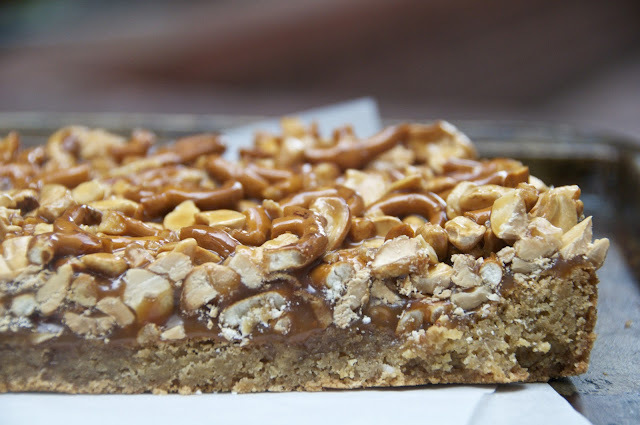 remember these brown butter blondies with cashew pretzel caramel? i daydream about them. snickerdoodles are my favorite kind of cookie when i'm in the mood to eat more than 3 cookies. so i made snickerdoodles, rolled them in spiced sugar, and shoved pretzels into them. oh ma gah. i might not be able to resist myself at all anymore. 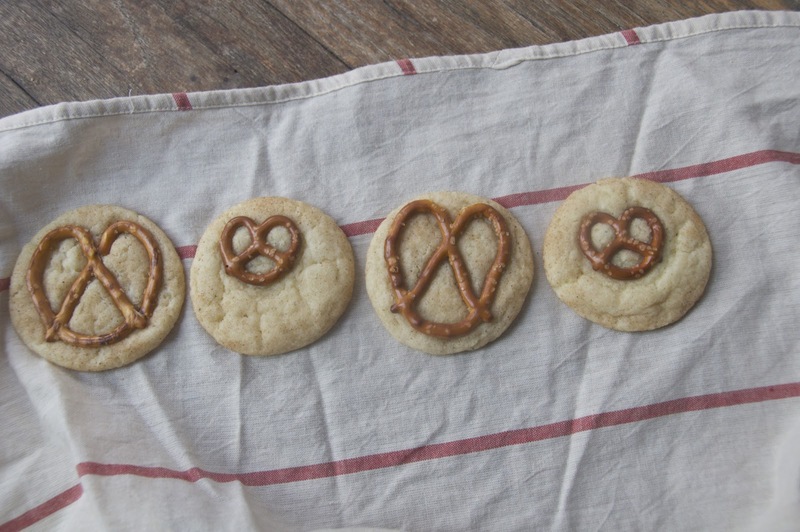 this might become a squash-pretzels-into-every-cookie-possible blog. preheat the oven to 375 and line a couple baking sheets with parchment paper. sift flour, cream of tartar, baking soda, and salt in a medium bowl, set aside. 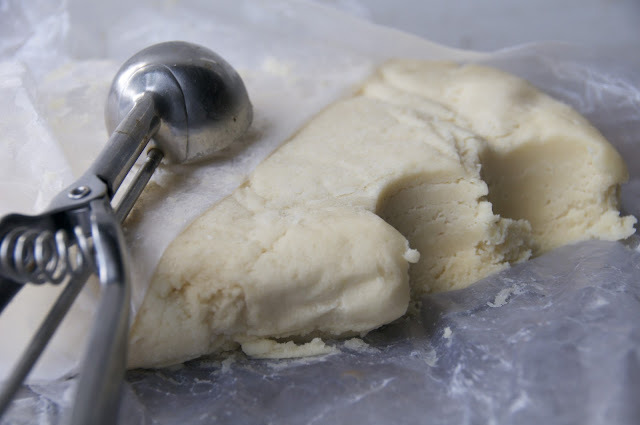 in the bowl of an electric mixer fitted with a paddle attachment, combine butter and 1 1/2 cups sugar. beat on medium speed until light and fluffy, about 2 minutes. scrape down sides of bowl. add eggs, one at a time, beating to combine. add dry ingredients, and beat to combine. chill the dough for at least 1 hour, up to overnight before baking. once dough is chilled, mix the 1/4 cup sugar with all the spices. scoop tablespoons of dough, roll into balls, and roll in the spiced sugar. place 2 inches apart on baking sheets. press the dough balls down just slightly with your palm. bake for about 8 minutes, until the cookies are puffed but still very soft in the centers. 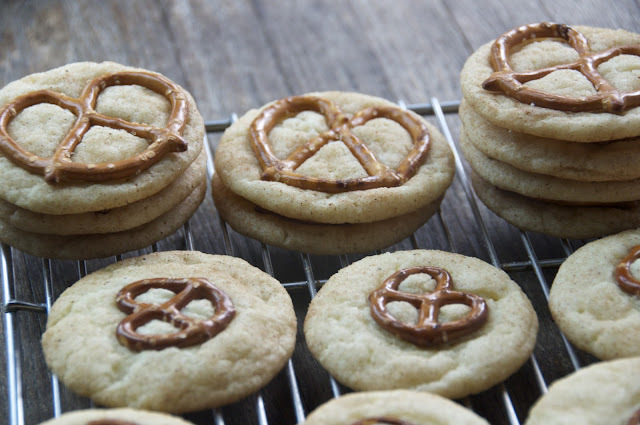 remove from oven and press a pretzel into each cookie. 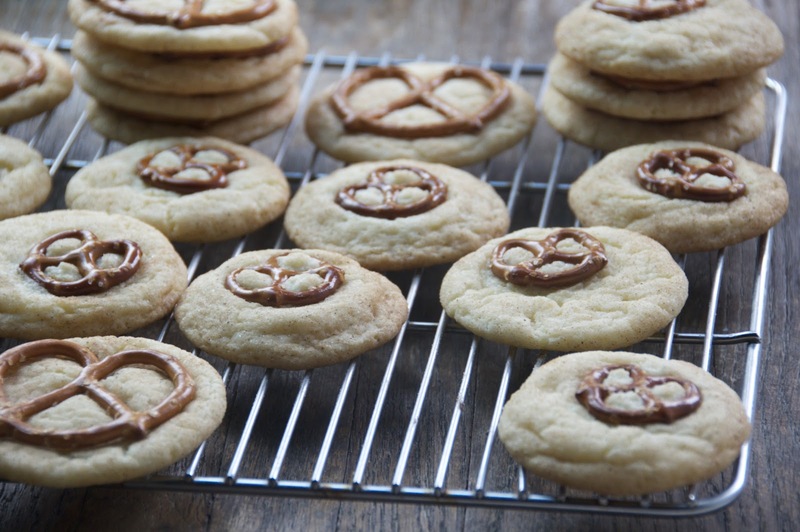 return to the oven and bake 2-3 minutes longer (the cookies won't brown). let cool a couple minutes on the sheets, then transfer to a wire rack to cool completely. Your routine sounds pretty much a lot exactly like my routine! Give me food immediately when I wake up or give me death. And coffee. Lots of coffee. 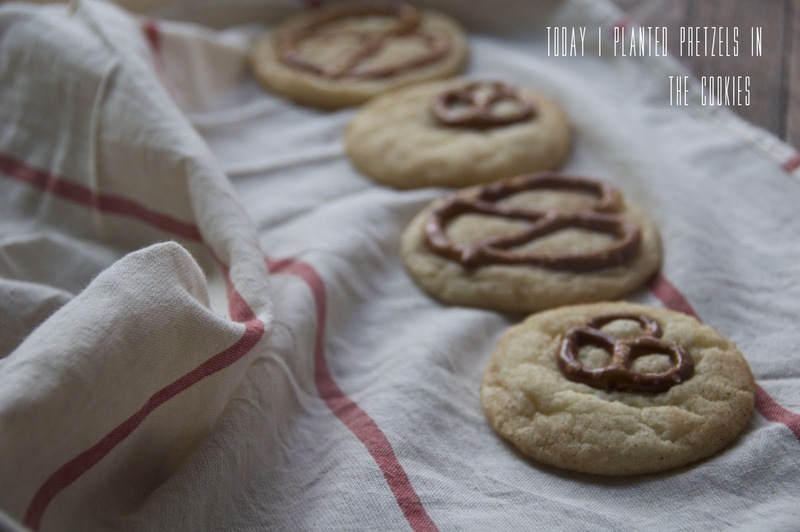 I need to start adding pretzels to more of my baked goods. 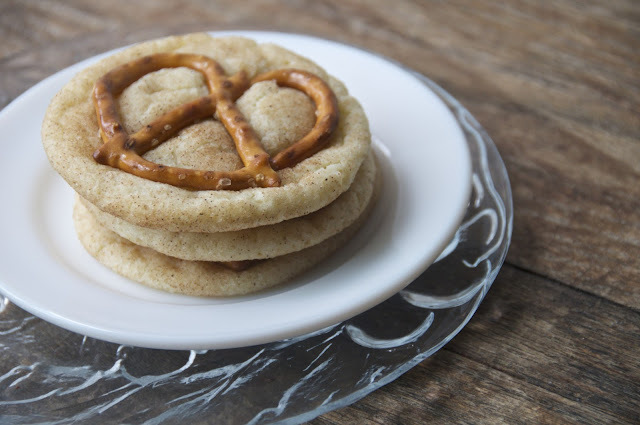 Snickerdoodles sound like the ideal place to start. Also, I just bought a box of Cheerios two days ago and lovingly remembered that same technique. It's not at all about saving milk for me though, it's about loving the cereal and more cereal and having an excuse to eat more. And more. Until I'm realllllly full of cereal. And yet somehow, I still want more. Glad I'm not the only one. Found you on theKitchn. New fan. loving yous guys! now get all up in a pretzel bag!